How much does it cost to travel to Florence? How much money will you need in Florence? 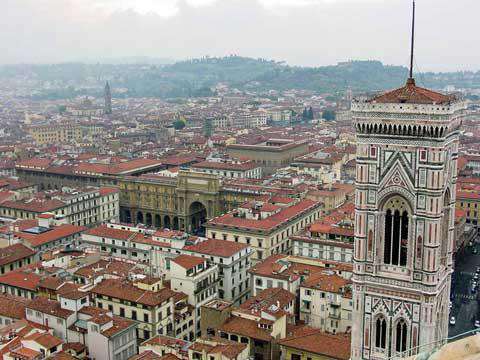 €116 ($130) is the average daily price for traveling in Florence. The average price of food for one day is €24 ($27). The average price of a hotel for a couple is €137 ($154). Additional pricing is in the table below. These average travel prices have been collected from other travelers to help you plan your own travel budget. How much money do I need for Florence? Florence is the capital of Tuscany and one of the most well known cities in Italy for its art and cultural scenes. The city is rooted in history and you can see this in the architecture, statues, gardens, and art that are everywhere around town. This city truly is a living museum. You should allow yourself at least a couple of days to explore Florence and if you can afford more, it is well worth the time. In particular, if art history is your passion then you will need a week or more to satisfy your interest as the museums and architecturally impressive buildings throughout the city are endless. The sights in Florence are endless and creating a full list is virtually impossible. You can walk around the city and see art and architecture at every corner. The city's most famous museum is the Uffizi, and one of its most well known landmarks is the Ponte Vecchio bridge. Along the bridge, which crosses the Arno River, you'll find shops selling everything. You can spend an afternoon in the Boboli Gardens, which has sculptures and extensive landscaping. Before you leave the city, you have to climb to the top of the Duomo, and then finish the evening with a nice cup of delicious gelato. But don't simply check the main sights off of a list. Find the smaller museums, the simple galleries, or the unassuming architecture and appreciate Florence for everything that it has to offer. Even if you're short on time spend an afternoon getting lost in the city and being surprised by what your find. Florence can be divided into several different neighborhoods. Around the Duomo you'll find the most central neighborhood. The Duomo is about halfway between the churches of Santa Maria Novella and Santa Croce. It is also about halfway between the Uffizi Gallery and the Ponte Vecchio in the south and San Marco and the Accademia (where you'll find Michelangelo's "David") in the north. This area is also where you'll find the most hotels which range in quality and price. Piazza della Signoria is where you'll find many museums including the Uffizi Gallery and the Bargello sculpture collection. San Lorenzo and the Mercato Centrale is the area between the train station and the Duomo and Piazza Santa Trinita is the main shopping area in Florence. Other notable neighborhoods include Santa Maria Novella, San Marco & Santissima Annunsiata, Santa Croce, and the Oltrarno, San Niccolo & San Frediano. As a major tourist destination there are countless tours you can take of Florence. They focus on almost any angle of the city so if you're interested in an organized tour you won't have much trouble finding one. Other activities around the city include seeing the street performers near the Uffizi, wandering through the Boboli Gardens, and excursions that take you outside of the city into the countryside. Food in Florence lives up to its reputation. You'll find excellent options for every budget, but you'll be most impressed if you head outside of the main toursity areas and figure out where the Italians eat. In particular, avoid eating in Mercato di San Lorenzo and head instead to the Santa Croce district. Also take note that prices are different for dining in versus take away. There is a fee to sit down, so don't buy your food at the to go booth and expect to grab a table. It's best to confirm this price in advance. If you've arrived in Florence with some jetlag, it is important to realize that most restaurants do not open for dinner until late in the evening. You may find yourself quite hungry if you don't grab a bite to eat in a shop or market. Plan ahead so you don't find yourself frustrated, although, rest assured, the food is well worth the wait. Florence is easily one of the most popular destinations in Italy. It's easy to hop on a train in Rome and be in Florence in a couple of hours. Do ensure that you're on an express train, as local trains tend to stop frequently and be painfully slow. They do, however, allow you glimpses of the small towns that are spread throughout Tuscany. Once you're in the city it's easy, and quite enjoyable to walk everywhere. In fact, the best way to soak up Florence is on foot, because its treasures are in its details. There is a descent bus system for when your legs get tired. One tram line also runs through the city. It runs about 7.5 kilometers and connects Santa Maria Novella train station to the southwestern suburb of Scandicci stopping about 14 times along the way.